Upper Black Eddy bed and breakfast travel guide for romantic, historic and adventure b&b's. 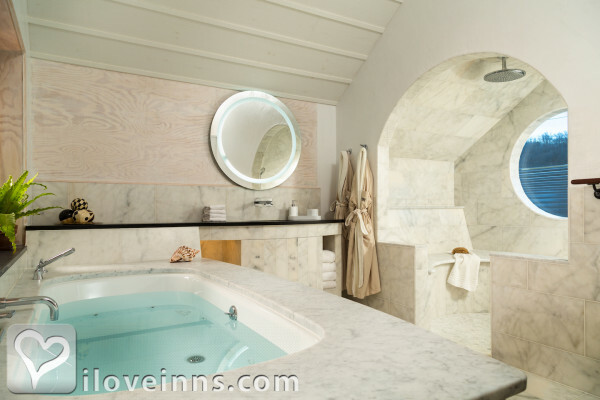 Browse through the iLoveInns.com database of Upper Black Eddy, Pennsylvania bed and breakfasts and country inns to find detailed listings that include room rates, special deals and area activities. You can click on the 'check rates and availability' button to contact the innkeeper. Upper Black Eddy is a community that is part of Northern Bucks County, in Pennsylvania. Interesting geological formations attract visitors and Upper Black Eddy is known for the rock cliffs overlooking the Delaware River. This natural wonder which is called Ringing Rocks County Park is two miles away from the center of the town. There are Upper Black Eddy bed and breakfast inns that take advantage of the views. There are plenty of fun activities surrounding the community as well. Guests favorites include canoeing or fishing at the Delaware River. They also go mountain climbing at the peaks near Upper Black Eddy. Other favorite destinations of locals and visitors alike are Delaware Canal State Park and Lake Nockamixon State Park. By Bridgeton House on the Delaware.